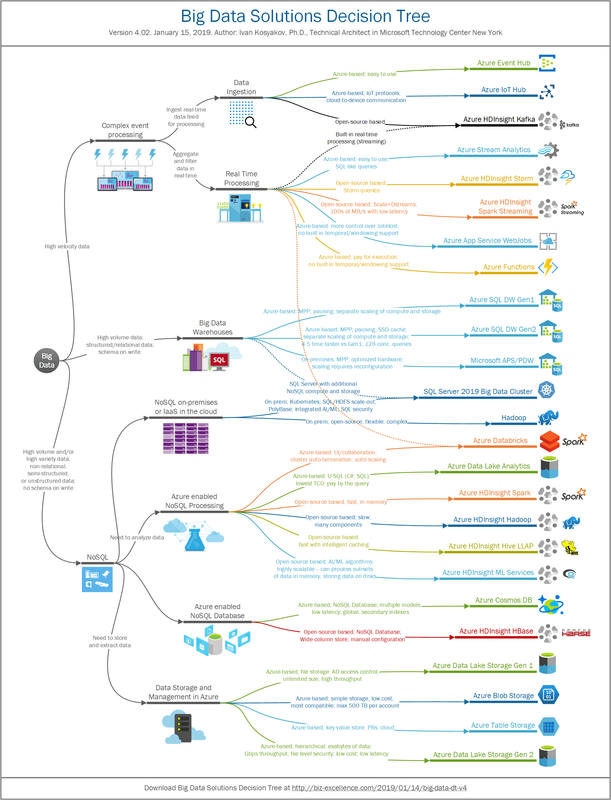 This is a 4th version of the Big Data Decision Tree (Mind Map), which reflects the last changes in Microsoft products. As usual, a disclaimer: The process of solution selection for Big Data projects is very complex with a lot of factors. That’s why you may use this decision tree only as a first approximation to start looking deep into described and other solutions. Also, please double check the information provided here in an official documentation. Volume: need to store and query hundreds of terabytes of data or more, and the total volume is growing. Processing systems must be scalable to handle increasing volumes of data, typically by scaling out across multiple machines. Velocity: need to collect data at an increasing rate from many new types of devices, from a fast-growing number of users, and from an increasing number of devices and applications per user. Processing systems must be able to return results within an acceptable timeframe, often almost in real-time. Variety: situation when data do not match any existing data schema – semi-structured or unstructured data. Complex event processing (CEP) is method of tracking and processing streams of data from multiple sources about events, identifying meaningful events, deriving a conclusion from them, and responding to them as quickly as possible. Use CEP if you need to process hundreds of thousands of events per second. Data Warehouses (DWHs) are central relational repositories of integrated data from one or more disparate sources. They store current and historical data and are used for different analytical tasks in organizations. Use DWH is you have structured relational data with defined scheme. NoSQL systems provide a mechanism for storage and retrieval of data without tabular relations. Characteristics of NoSQL: simplicity of design, simpler “horizontal” scaling to clusters of machines. The data structures used by NoSQL databases (e.g. key-value, wide column, graph, or document) are more flexible, and therefore more difficult to store in relational databases. Use NoSQL systems if you have non-relational, semi-structured, or unstructured data; with no schema defined. Here is the decision tree, which maps the three types of problems to specific solutions. Here are some most important comments on each of the big data components and corresponding decision points. Azure Event Hubs is a highly scalable data streaming platform and event ingestion service, capable of receiving and processing millions of events per second. Event Hubs can process and store events, data, or telemetry produced by distributed software and devices. Data sent to an event hub can be transformed and stored using any real-time analytics provider or batching/storage adapters. Event Hubs provides publish-subscribe capabilities with low latency at massive scale, which makes it appropriate for big data scenarios. Disadvantages: limited access revocation through publisher policies. Azure IoT Hub is a managed service that enables reliable and secure bidirectional communications between millions of IoT devices and a cloud-based back end. Feature of IoT Hub include: multiple options for device-to-cloud and cloud-to-device communication; message routing to other Azure services; queryable store for device metadata and synchronized state information; secure communications and access control using per-device security keys or X.509 certificates; monitoring of device connectivity and device identity management events. In terms of message ingestion, IoT Hub is similar to Event Hubs. However, it was specifically designed for managing IoT device connectivity, not just message ingestion. Integration: supports MQTT, AMQP, HTTPS protocols. Advantages: supports cloud-to-device communications, device-initiated file upload, device state information using Device twins; per-device identity; revocable access control. Advantages: simplified configuration process; 99.9% SLA on Kafka uptime; scaling (changing number of worker nodes) and rebalancing Kafka partitions and replicas using Update Domains (UD) and Fault Domains (FD); monitor Kafka using Azure Log Analytics; integration with external authentication services supported. Azure Stream Analytics (ASA) may be used for real-time insights from devices, sensors, infrastructure, and applications. Scenarios: real-time remote management and monitoring. ASA is optimized to get streaming data from Azure Event Hubs and Azure Blob Storage. ASA SQL-like queries run continuously against the stream of incoming events. The results can be stored in Blob Storage, Event Hubs, Azure Tables and Azure SQL database. So, if the output is stored in Event Hub it can become the input to another ASA job to chain together multiple real-time queries. Disadvantages: supports only Avro, JSON or CSV, UTF-8 encoded input data formats. Apache Storm is a distributed stream processing computation framework written predominantly in the Clojure programming language. A Storm application is designed as a “topology” in the shape of a directed acyclic graph (DAG). Edges on the graph are named streams and direct data from one node to another. Together, the topology acts as a data transformation pipeline. Storm topologies run indefinitely until “killed”. Storm uses Zookeeper to manage its processes. Storm can read and write files to HDFS. Architecture: Storm processes the events one at a time. Disadvantages: supports only streaming data, not integrated with Azure platform. Notes: priced per cluster hour. Spark Streaming is used to build interactive and analytical applications. Used to create low-latency dashboards and security alert system, to optimize operations or prevent specific outcomes. Includes high-level operators to read streaming data from Apache Flume, Apache Kafka, and Twitter; historical data – from HDFS. Architecture: Spark streams events in small batches that come in short time window before it processes them. Performance: 100s of MB/s with low latency (few seconds). Disadvantages: not integrated with Azure platform. WebJobs is a feature of Azure App Service that enables you to run a program or script in the same context as a web app, API app, or mobile app. Programmability: C#, Node.js, PHP, Java, Python; imperative paradigm. Advantages: more control over JobHost behavior in the host.json file (for example, to configure a custom retry policy for Azure Storage). Disadvantages: No built-in temporal/windowing support; no late arrival and out of order event handling support. Notes: priced per app service plan hour. Azure Functions is a solution for easily running small pieces of code, or “functions,” in the cloud. Azure Functions lets you respond to events delivered to an Azure Event Hub. Useful in application instrumentation, user experience or workflow processing, and internet-of-things (IoT) scenarios. Programmability: C#, F#, Node.js; imperative paradigm. Advantages: pay only for the time your code runs and trust Azure to scale as needed. Disadvantages: No built-in temporal/windowing support; limited by up to 200 function app instances processing in parallel; No late arrival and out of order event handling support. Notes: priced per function execution and resource consumption. Azure SQL Data Warehouse (DW) is MPP version of SQL Server in Azure for data warehousing workloads. It allows to quickly run complex queries across petabytes of data, allows resize of compute nodes in a minute, and integrated with Azure platform. Advantages: highly scalable, MPP architecture, lower cost relational storage than Blobs, feature of pausing compute is available, relational store, T-SQL, flexible indexing, security. Disadvantage: 4-5 times less powerful than Azure SQL DW Gen2; cannot query from external relational stores; no row-level security; no dynamic data masking. Azure SQL DW Gen2 comes with five times the compute capacity and four times the concurrent queries of the Gen1 offering. The enhanced storage architecture on Gen2 introduces unlimited columnar storage capacity, while maintaining the ability to independently scale compute and storage. Azure SQL Data Warehouse Compute Optimized Gen2 tier comes with up to 5 times better query performance, 4 times more concurrency, and 5 times higher computing power compared to the Gen 1. It can serve 128 concurrent queries from a single cluster. Powering these performance gains is adaptive caching technology that understands where data needs to be and when it needs to be there for the best possible performance. Azure SQL Data Warehouse takes a blended approach of using remote storage in combination with a fast SSD cache layer (using NVMes) that places data next to compute based on user access patterns and frequency. Automatically upgrade from Gen1 to Gen2 is available from the Azure portal. Advantages: 4-5 times more performant, concurrent and higher compute compared to Gen 1; supports pausing compute, Transparent Data Encryption with customer-managed keys. Microsoft Analytics Platform System (APS) is a combination of the massively parallel processing (MPP) engine in Microsoft Parallel Data Warehouse (PDW) with Hadoop-based big data technologies. It uses the HDP to provide an on-premises solution that contains a region for Hadoop-based processing, together with PolyBase—a connectivity mechanism that integrates the MPP engine with HDP, Cloudera, and remote Hadoop-based services such as HDInsight. It allows data in Hadoop to be queried and combined with on-premises relational data, and data to be moved into and out of Hadoop. Advantages: very cost-effective fast MPP architecture if constantly and fully used. Disadvantages: make sure that for most of queries you don’t initiate data movements between the nodes which is more expensive operation; increasing size requires to buy additional rack and reconfigure manually. Starting with SQL Server 2019 preview, SQL Server big data clusters allow you to deploy scalable clusters of SQL Server, Spark, and HDFS containers running on Kubernetes. These components are running side by side to enable you to read, write, and process big data from Transact-SQL or Spark, allowing you to easily combine and analyze your high-value relational data with high-volume big data. In SQL Server big data clusters, Kubernetes is responsible for the state of the SQL Server big data clusters; Kubernetes builds and configures the cluster nodes, assigns pods to nodes, and monitors the health of the cluster. This means that SQL Server Big Data Cluster can be easily deployed in any cloud supporting Kubernetes clusters. Advantages: on-pSQremises/IaaS allows customization; SQL Server supports dynamic data masking, row level security; using PolyBase can query and join with external data sources without moving or copying the data; scalable HDFS storage pool; scale-out data marts; integrated AI and Machine Learning; can be deployed in non-Microsoft clouds supporting Kubernetes clusters. Disadvantages: currently in a public preview. Apache Hadoop is the original open-source framework for distributed processing and analysis of big data sets on clusters. The Hadoop technology stack includes related software and utilities, including Apache Hive, Apache HBase, Spark, Kafka, and many others. In Azure Marketplace there are available Hortonworks, Cloudera and MapR implementations of Hadoop. Advantages: flexibility: can be used on-premises or in IaaS cloud environment (easy migration); full control over deployment. Disadvantages: complexity of deployment; need to manage updates. Azure Databricks is an Apache Spark-based analytics platform optimized for the Microsoft Azure cloud services platform. Designed with the founders of Apache Spark, Databricks is integrated with Azure to provide one-click setup, streamlined workflows, and an interactive workspace that enables collaboration between data scientists, data engineers, and business analysts. Programmability: Python, Scala, Java, R, SQL. Advantages: user friendly UI for collaboration and experimentation (notebooks, cluster creation etc. ); fast cluster start times, auto-termination, auto-scaling; supports pausing compute; supports fast scale-out (less than 1 minute); supports GPU-enabled clusters; security with native AD integration. Disadvantages: cannot act as a relational data store; no row-level security. Notes: priced by Databricks Unit (DBU) and cluster hour; does not support firewalls. Azure Data Lake Analytics (ADLA) is a distributed analytics service built on Apache YARN. It handles jobs of any scale instantly by setting how much compute power is needed. It allows to do analytics on Exabytes of data, and customers still pays only for the cost of the query. ADLA supports Azure Active Directory for Access Control, Roles, Integration with on-premises identity systems. It also includes U-SQL, a language that unifies the benefits of SQL with the expressive power of C#; runtime processes data across multiple Azure data sources. ADLA allows you to compute on data anywhere and a join data from multiple cloud sources like Azure SQL DW, Azure SQL DB, ADLS, Azure Storage Blobs, SQL Server in Azure VM. Advantages: easy to start on big data leveraging SQL and C# skills; AAD; security; integrated with Azure platform and Visual Studio; can be priced per job; supports fast scale-out (less than 1 minute). Disadvantages: currently only batch mode is supported — you may use HDInsight for other types of workloads; no clear roadmap; not compatible with ADLS Gen2; no in-memory caching of data; no row-level security; no dynamic data masking. HDInsight is a cloud-hosted service available to Azure subscribers that uses Azure clusters to run HDP (Hortonworks’ distribution of Hadoop), and integrates with Azure storage. Supports a variety of open source analytics engines such as Hive LLAP, Storm, Kafka, HBase, Apache Storm, Spark. Advantages: cloud-based which means that the cluster can be created approximately in 15 minutes; scale nodes on demand; fully managed by Microsoft (upgrades, patching); some Visual Studio and IntelliJ integration; 99.9% SLA. Apache Spark is an open source cluster computing framework. It provides API based on resilient distributed dataset (RDD), a read-only multiset of data items distributed over a cluster of machines. RDDs function as a working set for distributed programs that offers a form of distributed shared memory. Components built on top of Spark: Spark SQL, Spark Streaming, MLlib, GraphX. Advantages: in-memory, fast (5-7 times faster than MapReduce). Disadvantages: less components if you compare with components based on MapReduce; no row-level security. Apache Hadoop includes two core components: the Apache Hadoop Distributed File System (HDFS) that provides storage, and Apache Hadoop Yet Another Resource Negotiator (YARN) that provides processing. With storage and processing capabilities, a cluster becomes capable of running MapReduce programs to perform the desired data processing. Advantages: a lot of open source components on top of MapReduce. Disadvantages: much slower that Spark; not in-memory. Interactive Query (also called Apache Hive LLAP, or Low Latency Analytical Processing) is an Azure HDInsight cluster type. Interactive Query supports in-memory caching, which makes Apache Hive queries faster and much more interactive. An Interactive Query cluster contains only the Hive service. Programmability: HiveQL (can be executed from Power BI, Apache Zeppelin, Visual Studio, Visual Studio Code, Apache Ambari Hive View, Beeline, Hive ODBC). Advantages: fast performance with intelligent caching (low latency); support ACID transactions; scalable query concurrency; optimized for speed serving layer. Disadvantages: cannot query external relational stores (like Azure SQL DB, SQL Server in VM, Azure SQL DW); manual configuration and scaling; no redundant regional servers for high availability. Azure HDInsight with ML Services (AKA R Server cluster on HDInsight) provides data scientists, statisticians, and R programmers with on-demand access to scalable, distributed methods of analytics on HDInsight. The service provides the latest capabilities for R-based analytics on datasets of virtually any size, loaded to either Azure Blob or Data Lake storage. Since ML Services cluster is built on open-source R, the R-based applications you build can leverage any of the 8000+ open-source R packages. The routines in ScaleR, Microsoft’s big data analytics package are also available. ML Services bridges these Microsoft innovations and contributions coming from the open-source community (R, Python, and AI toolkits) all on top of a single enterprise-grade platform. Programmability: ML Services includes highly scalable, distributed set of algorithms such as RevoscaleR, revoscalepy, and microsoftML that can work on data sizes larger than the size of physical memory, and run on a wide variety of platforms in a distributed manner. Includes Microsoft’s custom R packages and Python packages. Advantages: can run AI packages from Microsoft and open-source; RevoscaleR allows to apply ML algorithms on top of data which cannot fit in memory of the cluster. Azure Cosmos DB is a globally distributed database service designed to elastically and independently scale throughput and storage across any number of geographical regions with a comprehensive SLA. It supports document, key/value, or graph databases leveraging popular APIs and programming models: DocumentDB API, MongoDB API, Graph API, and Table API. Advantages: different formats of storage, global distribution, elastic scale out, low latency, 5 consistency models, automatically indexed, schema agnostic, native JSON, stored procedures. Disadvantages: no support for in-memory caching of data; no dynamic data masking. Apache HBase is a NoSQL wide-column store for writing large amounts of unstructured or semi-structured application data to run analytical processes using Hadoop. It provides random access and strong consistency for large amounts of unstructured and semistructured data in a schemaless database organized by column families. Data is stored in the rows and columns of a table, and data within a row is grouped by column family. Programmability and integration: Phoenix, OpenTSDB, Kiji, and Titan etc. can run on top of HBase by using it as a datastore; Apache Hive, Apache Pig, Solr, Apache Storm, Apache Flume, Apache Impala, Apache Spark , Ganglia, and Apache Drill also can integrate with HBase. Advantages: NoSQL wide-column store; can be used as key-value store, for sensor data, for real-time querying; optimized for speed serving layer. Disadvantages: manual configuration and scaling; no support for in-memory caching of data. Notes: supports SQL language using Phoenix JDBC driver. Azure Data Lake Store (ADLS) is a distributed, parallel file system in the cloud performance-tuned and optimized for analytics based on different data types. It is supported by leading Hadoop distributives: Hortonworks, Cloudera, MapR, HDInsight and Azure Data Lake Analytics (ADLA). Development: WebHDFS protocol (behaves like HDFS); REST API over HTTPS. Advantages: hierarchical file system; optimized performance for parallel analytical workloads; high throughput and IOPs; no limit on account sizes, file sizes or number of files. Disadvantages: only locally redundant; not available in some regions. Azure Blob Storage is a general purpose object store for a wide variety on storage scenarios. It is highly available, secure, durable, scalable, and redundant. It provides hot, cool, and archive storage tiers for different use cases. Advantages: most compatible; globally redundant; lowest storage costs; better for simple non-hierarchical storages; client-side encryption. Disadvantages: flat namespace; not optimized for analytical workloads; max 500 TB per account and 4.75 TB per file. Azure Table Storage allows you to store petabytes of semi-structured data while keeping costs down, without manual sharding. Using geo-redundant storage, stored data is replicated 3 times within a region—and an additional 3 times in another region. Azure Data Lake Storage Gen2 is a set of capabilities dedicated to big data analytics, built on Azure Blob storage. In Data Lake Storage Gen2 features from Azure Data Lake Storage Gen1, such as file system semantics, directory, and file level security and scale, are combined with low-cost, tiered storage, high availability/disaster recovery capabilities from Azure Blob storage. Advantages: able to store and serve many exabytes of data with throughput measured in gigabits per second (Gbps) at high levels of input/output operations per second (IOPS); near-constant per-request latencies; hierarchical namespace significantly improve the overall performance of many analytics jobs. Disadvantages: A little more expensive on transactions costs compared to Gen1.